I like it! I think the bright aqua and the dark brown give it just the right accents! It is a delightful boys quilt Kelly! Always like brown and turcoise together, the stripes are great and I LOVE the bike fabric!!! Kelly, I think you are being way to hard on yourself. It is so pretty, or whatever is gender neutral to say! The turquois sets the other colors off. Great job! I love the teal, brown, and coral together. I need to collect some of those! Such a fresh and fun mix of colors and prints! I like it! Me, too, like it I mean. Great combination of colors I think. I too think there is plenty of value variation. You have distributed the brown and white well, and the pale colors make a nice back drop for the bright aqua. I have to say that I love it already! I can understand your hesitation to it as the colors are very different than the last few that you have posted, but it is beautiful. Don't doubt it...go with it! I like the blue hue and the coral together. I think that you will like it much better once you quilt and bind it too! I always look forward to putting the binding on a quilt - sometimes it is exactly what the quilt needs to pull everything together. I do like this quilt! Your title had me curious:) Sometimes its a great quilt, but just not what we were shooting for! Looks great and I bet you will love it when you quilt it up. I think it is fabulous and the colors are right on. You will probably love it after it's quilted. It looks like it could be used for either a boy or girl because of the colors you used. I love the strips as they are nice and simple and it would be great for a boy or girl. It will look differently when it is bound and quilted, then it will be more cuddly. It's hard making boy quilts isn't it? Those cute frilly girl fabrics just jump out at ya and take over for goodness sakes. I find I have to forcefully make a boy quilt as well. But I adore your fabric choices. It think there's just enough dark in there to make it interesting yet not overpowering so it's a bit calm for nap time. The brown is very strong and I think that's what gives it the good balance. Love it. I think I know what you are reacting to but don't worry it works. I took a look at some of the other entries in your blog and you seem t be working with a lot of colour and not much tonal variation. The brown and turquoise blue really pop in a few spots because they are such wide bands of colour but they balance each other and some of the lighter colours in the quilt. It's all good but in the end you have to like it and be happy with it regardless of what others say. I love it! I actually prefer the smaller scale prints rather than the large scale ones, so this is exactly my sort of fabric. It looks great sewn up in the strips. I love this too! Beautiful fabrics and the pattern is so appealing! Great job!!! I like it, too, but what about adding some big applique to the top? It might make it pop more or you could add a color that you feel is lacking. Either way, I think you did a great job! Great fabrics and colors! I think once you have this quilted you will love it, I know that happens to me alot! Thanks for sharing. I really like the different strip widths- it adds lots of interest. Love this quilt Kelly -- you are so amazing!! So simple, so beautiful, so BOY!! You keep inspiring us girl -- thanks so much! I think your quilt is darling. The colors are perffect for a little boy. Did you folllow a pattern? I'd love to make one like this. Love the colour palette, Kelly! And the piecing does add interest, too. Those bikes are great! What boy wouldn't love this quilt?!!! This style of quilt is definitely on my to-do list. I love the various stripes! Strip quilting can be fun! Yours came out quite wonderful! Love the choice of fabrics and colors. Cute that your young one noticed not too many quilts for boys! :)Thanks for stopping by blog too! Happy quilting weekend! 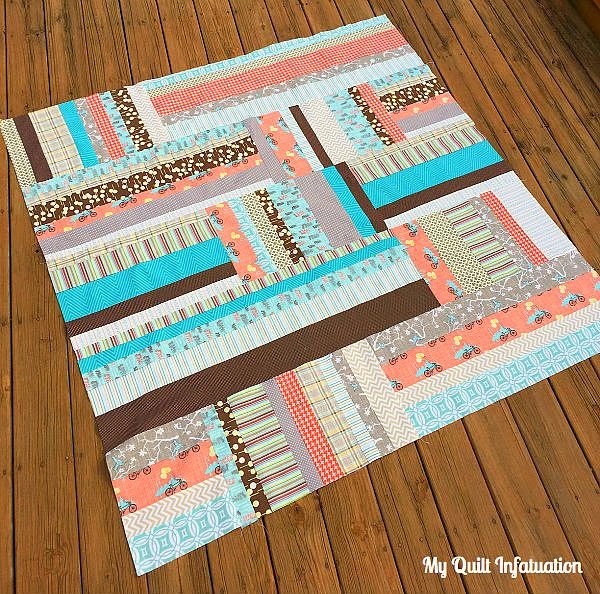 Lovely quilt - thanks for linking to TGIFF!